On May 11, 2017, Renato Matos and John Osborn presented a webinar on Negotiating Architect and Construction Contracts as part of the Faith-Based Webinar Series. In May 2016, the firm was honored by the Long Island Council of Churches for the pro bonolegal services they have provided the Council and its member churches. This article was co-written by Elder Law Partner Stuart Schoenfeld. In order to qualify for Medicaid, an applicant is required to meet specific resource and income standards. For individuals applying for either nursing home or community Medicaid coverage in 2014, the resource threshold (the maximum amount of “non exempt” assets an individual can have in his or her name in order to qualify for Medicaid) is $14,550 in New York State. Certain assets, such as a home, are exempt assets provided that either the Medicaid applicant or his spouse occupy the premises as his or her primary residence. The Deficit Reduction Act of 2005 (the “DRA”) imposed a five-year “look-back” for individuals applying for nursing home Medicaid coverage. As a general rule, asset transfers made by the applicant or his or her spouse during the five year period prior to the submission of the Medicaid application will result in a period of Medicaid ineligibility. It is important to note that under current New York law the Medicaid look-back rules apply only to nursing home Medicaid but not to applications for community care (i.e. an individual may transfer all of her assets on the 31st day of the month and be eligible for community Medicaid coverage on the 1st day of the following month). Because of Medicaid’s resource limits and five-year look-back rules, it is important that individuals who wish to protect and preserve their assets complete a Medicaid plan in a timely manner in order to prevent the imposition of a penalty should future nursing home care be required. There are various planning techniques that can be utilized when creating an effective asset preservation plan. In evaluating when and how to transfer assets, it is crucial that the elder law attorney carefully consider both the tax and non-tax ramifications. This article evaluates various gifting techniques from the perspective of maximizing available tax benefits. Gifting assets to children or other loved ones outright is the simplest method of transferring resources. However, this technique will frequently result in significant adverse tax consequences. As described in greater detail below, under IRC Section 1015(a), the donor’s basis in the gifted asset will carry over to the donee. The donee/child will be responsible for income taxes on the realized gain when the asset is sold. If the child is in a higher income tax bracket than the donor/parent, the ultimate income tax obligation could be substantially greater if the asset is sold by the child rather than the parent. This is especially important in light of the recent tax increases enacted by the American Taxpayer Relief Act of 2012. There are additional concerns if the gifted asset is a residence. Transferring a residence by outright gift to a child may result in the loss of real estate tax exemptions such as the enhanced star, senior citizens or veteran’s exemptions. In addition, the child may not qualify for the IRC Section 121 exclusion which permits an individual to exclude $250,000 of profit upon the sale of a principal residence ($500,000 in the case of a married couple). One of the most important issues to consider regarding an outright gift is the loss of the step-up in basis. Ordinarily, the tax basis of assets owned by an individual as of the date of his or her death is ‘stepped up’ or increased to the asset’s fair market value as of the date of death. Retaining the step-up in basis is a very powerful tax planning tool, as it can effectively eliminate any income tax liability if the asset is sold soon after the death of the parent. An asset that is gifted by the parent during his or her lifetime will retain the donor’s basis and will not qualify for a step-up in basis upon the parent’s death. As stated above, the child will be obligated to realize the gain upon the later sale of the asset based on the parent’s carryover basis. A related strategy for creating an outright gift that is commonly utilized with respect to a residence is to transfer the property subject to a life estate reserved by the donor parent. Reserving a life estate allows the parent to retain the right to use and occupy the property for the rest of his or her life. It should allow the parent to retain many of the tax benefits discussed above such as available real estate tax exemptions and the basis step-up. A key implication that must be considered is the gifted residence’s impact on the donor’s taxable estate. Due to the fact that the donor retains an interest in the house, the value of the house will be included in the taxable estate of the donor. Thus, although it will qualify for the step-up in basis, there will be an increase in the donor’s taxable estate which may result in increased federal and state estate taxes. Furthermore, if the house is sold during the parent’s lifetime, the children will be responsible for the capital gains taxes on the profit attributable to the value of the remainder interest based on the difference in the sale price and the parent’s carryover basis. It is important to note that as the parent ages, the proportionate value of the life estate decreases and the proportionate value of the remainder interest increases. Accordingly, the taxes attributable to the profit resulting from a sale of the remainder interest will also increase. Selling the property during the parent’s lifetime could present a potentially significant financial burden for the children. Moreover, it is important to note that the Section 121 exclusion will be limited to the value of the life estate only. If the value of life estate is less than $250,000 ($500,000 in the case of a married couple) use of the Section 121 exclusion will be limited. Although it is beyond the scope of this article, there are significant non-tax implications that must also be considered when transferring assets. There are a number of significant issues frequently overlooked when gifting an asset or transferring a house subject to a life estate. Creditor and bankruptcy issues of the child/donee, the unintended consequences of a child predeceasing the parent, divorce of a child/donee and the disability of a child or grandchild, are some of the issues that should be carefully considered prior to making the gift. As with other gifting strategies, an Irrevocable Medicaid Qualifying Trust will permit the parents to protect and preserve their assets should long term community or nursing home care be required. With proper drafting, the gifted property held in the trust should remain eligible for available tax benefits and can also be protected in the event a child faces legal and/or financial difficulties. In order for the trust assets to be viewed by Medicaid as unavailable to the parent, (1) the trust must be irrevocable and (2) the parent/settlor may not serve as trustee. Furthermore, any principal or income that pursuant to the terms of the trust can be distributed by the trustee to the parents will be considered available for Medicaid purposes. When creating a Medicaid Qualifying Trust, the goal should always be to protect assets while maximizing available income and estate tax benefits, such as the Section 121 exclusion, star exemption, and veteran’s benefits. In many situations, it may be beneficial to construct the trust in a manner that will allow the transfers to be treated as a completed gift for Medicaid purposes, but as an incomplete gift for tax purposes. In other situations, it might be beneficial to structure the transfer as a completed gift for both Medicaid and tax purposes. Such circumstances may include the scenario where the total value of the estate is in excess of the applicable state and/or federal estate tax exemption levels or where the basis of the transferred property is high, and a later sale utilizing the carryover basis would not result in significantly increased capital gains taxes. Another circumstance where a completed gift might be beneficial is where the asset generates significant income for the settlor, which could be detrimental in the event the settlor enrolls in Medicaid at some point in the future. Individuals with significant assets may, with the aid of counsel, determine that it is beneficial to establish two or more trusts whereby certain assets, such as those with a high basis or those that generate significant income, are transferred out of their names for both estate tax and Medicaid purposes while other assets, such as a residence and those assets with a low tax basis remain part of their estate for estate and income tax purposes. The drafting attorney should also consider including other important estate tax planning techniques for inclusion in the trust, such as bypass/credit shelter provisions, if applicable. Establishing a viable plan to protect and preserve assets involves the development of a comprehensive strategy both from an elder care and tax planning perspective. A plan cannot be designed and executed without consideration of both the tax and non-tax implications. In many situations, a properly drafted Medicaid Qualifying Trust will be the most effective way to achieve all of the planning objectives. This article first appeared in the February 2014 edition of the Nassau Lawyer and is reprinted with permission by the Nassau County Bar Association. This article was co-authored by Tax Partner Robert S. Barnett. Asset protection is often an important goal in estate and financial planning. The central vehicle is often a family asset protection trust. In drafting such a trust, the settlor’s intent is of central importance and needs to be clearly presented. A discretionary trust may be the ideal method of providing increased coverage. The law regarding asset protection trusts is a changing area, as the Restatement (Third) of Trusts modifies the traditional approach long promoted by the Restatement (Second). Careful attention must be paid to the trust distribution provisions, and this article presents some practical considerations. Generally, creditors can only reach those assets that have been distributed or to which a beneficiary has an enforceable right. In a pure discretionary trust, the trustee is granted absolute and complete discretion, thereby limiting the beneficiary’s rights. In a well-prepared asset protection trust, the trustee has discretion regarding the amount to distribute, the timing of a distribution, whether to make any distributions at all, and which beneficiaries, if any, will receive distributions. A distribution provision in a pure discretionary trust might read: “So much, all, or none of the principal may be paid to any, all, or none of the beneficiaries at any time or from time to time, as the trustee, in his or her sole, absolute, and unfettered discretion may determine.” This language can be contrasted with that found in many trusts: “Income and/or principal shall be paid to the beneficiary for health, education, maintenance, and support.” This type of provision is referred to as an ascertainable standard and is less effective for asset protection purposes, due to the use of the word “shall” and due to the fact that a court may determine that beneficiaries or creditors have an enforceable right to a distribution. In a pure discretionary trust, the beneficiary’s rights are more limited than in a trust with an ascertainable standard. If a beneficiary “shall” or “may for health, education, maintenance, and support” receive a certain amount of trust principal, a trustee could be compelled to make a distribution to a creditor. Conversely, if the beneficiary “may in the trustee’s sole and absolute discretion” receive trust principal, neither the beneficiary nor the beneficiary’s creditors can require that a distribution be made. Note, however, that New York Civil Practice Laws and Rules Section 5205(d)(1) provides that up to ten percent of trust income may be available to a creditor seeking satisfaction of a money judgment. Notwithstanding this ten-percent invasion right, under a pure discretionary standard, both the beneficiary’s and the creditor’s access to the trust fund is limited. It is recommended that the trust also contain provisions regarding the settlor’s intent that the trust not be invaded. This was the approach long taken by the Restatement (Second), published in 1959. The Restatement (Second) provides that the extent of a beneficiary’s enforceable interest in the trust (and the extent of creditor protection) is determined by the amount of discretion granted to the trustee. Provided that the trustee is afforded “sole, absolute, and unfettered” discretion, the trust is likely to be classified as purely discretionary with complete asset protection. The Restatement (Third), published in 2003, takes a new approach to discretionary trusts, which is of concern to asset protection planners. According to the Restatement (Third), even if the trust grants the trustee complete discretion, a standard of reasonableness or good faith may be imputed based on “the extent of the trustee’s discretion, the various beneficial interests created, the beneficiaries’ circumstances and relationships to the settlor, and the general purposes of the trust.” The Restatement goes on to state that even if the trustee has complete discretion, “it is rare [ ] that the beneficiary’s circumstances, the terms of the discretionary power, and the purposes of the trust leave the beneficiary so powerless” that a distribution could not be compelled. The Restatement Third does not provide any absolutes with regard to asset protection, nor does it provide any instruction for drafting a pure discretionary trust in which a beneficiary has no enforceable interest. It is unclear to what extent the courts will interpret and apply this language, and different jurisdictions will likely take different approaches. If the court treats discretionary trusts as if they contain an ascertainable standard, asset protection may be negated or severely limited. Thus, in jurisdictions that have not enacted laws governing the issue, drafters may be advised either to grant the trustee absolute discretion or to draft the trust under the laws of a jurisdiction with a statute affording creditor protection to discretionary trusts. In all events, the settlor’s intent should be clearly established, as this may be a defining characteristic of asset protection trusts. New York has no statute on point with regard to asset protection and discretionary trusts, nor has it expressly adopted the approach of either Restatement (Second) or Restatement (Third). There is, however, ample case law on the subject. When the trustee is granted complete and absolute discretion, the law “is clear that a creditor … cannot compel the trustee to pay any part of the income or principal to the beneficiary.” Vanderbilt Credit Corp. v. Chase Manhattan Bank, NA, 473 N.Y.S.2d 242, 245 (1984). However, if discretion must be exercised according to a specific standard, there may not be complete creditor protection and the beneficiary (or creditor) may have an enforceable interest. As illustrated by Escher, the settlor’s intent will be examined if the discretion is limited by an ascertainable standard. If the creditor can compel a distribution on behalf of a beneficiary, the creditor may be able to reach the trust assets, thereby negating any asset protection. Therefore, in situations where creditor protection is a significant concern, it is advisable to avoid the use of such standards and to grant the trustee complete discretion or, if a standard is insisted upon, to clearly express how the settlor intends for the discretion to be exercised. Additional consideration may be given to placing the trust situs in a jurisdiction that has not adopted the Restatement (Third) or has enacted statutes to enforce asset protection trusts. In conclusion, the law regarding asset protection and discretionary trusts is currently in flux due to the changes set forth in the Restatement (Third). When asset protection is desired, it is recommended that the trust grant the trustee complete discretionary and clearly express the settlor’s intent to prohibit beneficiaries and creditors from compelling distributions. 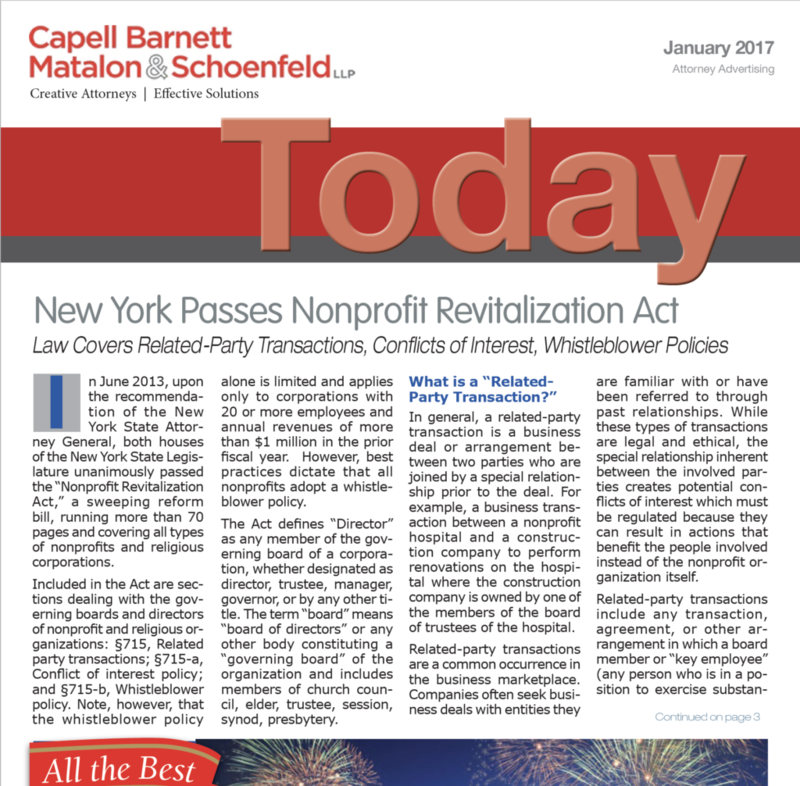 This article first appeared in the January 2013 NYSSCPA newsletter. Tax Partner Robert S. Barnett published this article in the May 2010 edition of the CPA Journal. The deductibility of interest is an often contested matter. Section 163 of the Internal Revenue Code allows a deduction for interest paid on a loan. However, the extent of the deduction depends on the manner in which the loan is utilized. For instance, interest paid on a loan allocated to business expenditures is deductible, while interest paid on a loan allocated to personal expenditures is not. The allocation of debt has a critical impact on the deductibility of the associated interest payments. Treasury Regulation 1.163-8T provides “tracing rules” that allocate debt and interest depending on the type of expenditure to which the proceeds are applied. The underlying property used to secure the loan is generally irrelevant; only the loan’s use is significant (subject to a limited exception for qualified personal residences). The tracing rules automatically allocate debt depending on how the proceeds are used. A 30-day rule allocates debt and interest to any expenditure within 30 days of receipt. After that 30-day period, the proceeds are treated as a personal expenditure. If the proceeds of a loan are paid directly to a third party, the debt and interest payments are automatically allocated to that expenditure. Loan proceeds deposited directly into an account may constitute an investment expenditure deductible as investment interest. The proceeds are re-allocated if and when they are applied to a different expenditure or the loan’s use changes. Assume Barry deposits a $10,000 loan into an account on January 1. On July 1, he uses $8,000 of that loan to purchase a personal vehicle. From January 1 through June 30, the debt and interest payments are allocated to an investment expenditure. From July 1 through December 31, $8,000 is allocated to the personal expenditure and $2,000 remains allocated to the investment expenditure. Expenditures from the account containing both borrowed and unborrowed funds are first allocated from the borrowed funds. Borrowed funds deposited earlier in time are deemed to be expended before subsequently deposited borrowed funds. However, if subsequently borrowed funds are utilized within 30 days of deposit, the taxpayer may elect out of this ordering rule. In such event, the 30-day rule described above is applied. For example, assume Barry’s account contains funds from Loan A, deposited on January 1, and Loan B, deposited on March 1. If Barry applies $6,000 to a personal expenditure within 30 days of his deposit of Loan B, he may elect to allocate the proceeds of Loan B to this expenditure, despite the fact that Loan A was deposited first in time. If a second loan is used to repay a prior loan or to pay interest on a prior loan, the interest payments of the second loan are allocated in the same manner as the interest payments of the first loan. If the proceeds of the second loan are used for purposes other than repayment of a prior debt, the proceeds are allocated according to their use (i.e. according to the general rules outlined above). On January 1, Barry borrows $10,000 (“Loan A”). Barry spends $5,000 on business property and $5,000 on a personal vehicle. According to the general allocation rules, $5,000 is allocated to the business expenditure and $5,000 to the personal expenditure. In December, Barry borrows $15,000 (“Loan B”). Barry uses the proceeds of Loan B to repay all of Loan A ($10,000) and spends the additional $5,000 on an investment expenditure. The debt and interest payments of Loan B are allocated as follows: $5,000 to the business expenditure (mirroring Loan A), $5,000 to the personal expenditure (mirroring Loan A), and $5,000 to the investment expenditure. When a portion of debt is repaid, such amount is no longer allocated to the given expenditure. The Treasury Regulations treat the debt as repaid in the following order: (i) personal expenditures; (ii) investment expenditures and passive activity expenditures (in the order the debt was allocated to the expenditure); (iii) passive activity expenditures associated with rental real estate in which the taxpayer actively participates; (iv) former passive activity expenditures; and (v) trade or business expenditures and certain low-income housing project expenditures. The following example illustrates a benefit of this ordering rule. Assume Barry borrows $10,000 on January 1. He spends $6,000 on a business expenditure on March 1 and $4,000 on a personal expenditure on August 1. In the next year, Barry repays $7,000 of the loan. The personal expenditure is treated as entirely repaid and $3,000 of the business expenditure is treated as repaid. Notice 89-35 contains special tracing rules for debt associated with pass-through entities in two situations: (i) debt-financed acquisitions and (ii) debt-financed distributions. However, these special rules do not apply if the pass-through entity was formed “with a principal purpose of avoiding or circumventing” the general tracing rules. In such case, interest expense is allocated according to the rules of Treas. Reg. 1.643-8T as if the pass-through entity had not been formed. A debt-financed acquisition occurs when the taxpayer borrows funds to purchase an interest in a pass-through entity or to contribute to the entity’s capital. When the taxpayer purchases the interest, the debt and associated interest expense are allocated among the entity’s assets using “any reasonable method,” such as a pro rata allocation based on fair market value or adjusted basis. Provided that the chosen allocation method is reasonable, this rule provides flexibility to obtain the most favorable outcome. For instance, assume Barry obtains a loan to purchase a $20,000 interest in S Corporation from Owner and the S corporation’s only assets are a building with a fair market value of $60,000 and stock valued at $40,000. Loan A is allocated $12,000 to the building (20,000*60,000/100,000) and $8,000 to the stock (20,000*40,000/100,000). Alternatively, Barry may allocate based on the assets’ adjusted basis or book value. The associated interest expense follows the allocation. Debt contributed to the entity’s capital and the associated interest expense are allocated using “any reasonable method,” such as a pro rata allocation among the entity’s assets or by tracing the proceeds of the loan to the entity’s expenditures as if the debt were incurred by the entity. The purchase of an interest is treated as a contribution to capital to the extent the entity receives the proceeds from the purchase of an interest. Thus, if Barry purchased his interest from S Corporation directly, the debt and interest is allocated among the entity’s assets or in accordance with the entity’s expenditures. Debt is re-allocated as necessary if the nature or use of the entity’s assets change. The associated interest expense is reported on Schedule A, if a personal expenditure, or Schedule E, if a trade or business, passive activity, or investment expenditure. Notice 88-37 provides additional guidance as to the reporting of the associated interest expense. In a debt-financed distribution, the pass-through entity’s debt and the related interest expense are allocated and reported according to each owner’s use of the proceeds. For example, if an owner uses distributed debt proceeds to purchase a passive activity interest, the owner’s share of the debt and interest expense are allocated to a passive activity expenditure. Each owner’s share of the entity’s interest expense is reported on Schedule K-1; each owner reports the interest expense based on his or her use of the debt proceeds. From the above example, the owner’s share of the interest expense was allocated to a passive activity and is reported on Schedule E.
A pass-through entity may elect to allocate the debt and interest associated with a distribution under an optional rule. Under this rule, the entity may allocate the debt and interest among its expenditures (other than distributions). This optional rule may be utilized only to the extent that distributed debt proceeds do not exceed the entity’s total expenditures; any excess debt and interest are allocated at the owner level according to the general rule described above. The entity reports the interest expense on Schedule K-1 based on the expenditure. For instance, if distributed debt proceeds are allocated to a rental activity, the interest expense should be considered when computing the rental activity’s income or loss on Schedule K-1. While not a tracing rule, there are provisions that re-characterize the interest on loans to passive activities. When a taxpayer loans money to a passive activity in which the taxpayer has an interest, the taxpayer incurs interest income, while the entity incurs a passive deduction for interest paid. The “self-charged interest rule” in Treas. Reg. 1.469-7 addresses this disconnect by treating such interest income as passive activity income to the extent of the taxpayer’s interest in the passive activity. Section 163 allows taxpayers to deduct interest paid on a loan, but limits the extent of the deduction depending on the expenditure to which the loan and interest are allocated. The tracing rules contained in Treasury Regulation 1.163-8T provide detailed rules regarding the allocation of the interest deduction. Taxpayers should maintain careful records detailing each loan and its utilization. As described in this article, various elections and default rules can be effectively used to maximize the interest deduction. This article first appeared in the May 2013 NYSSCPA newsletter.